Fluke is a comedy adapted from James Herbert’s novel of the same name, directed by Carlo Carlei, who also wrote the script, along with James Carrington. 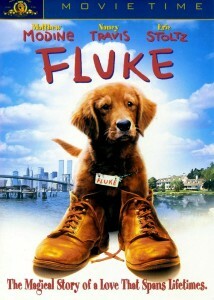 In 1996, Fluke was nominated for two Saturn Awards, for Best Fantasy Film and Best Performance by a Younger Actor (Max Pomeranc). The film hit theatres in June 1995 and was released on DVD in March 2001.